~ nestled in the hill country of Texas, but only a thought away from the vast Arizona and New Mexico regions where lies the heart of Native American traditions in pottery, rugs, art and other artifacts. SPIRIT HORSE GALLERY has a wide range of items for the admirer of Native American art- from the beginning collector to a sophisticated collector looking for museum quality pieces. 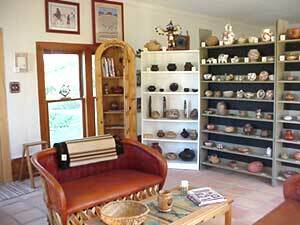 These include- in addition to pots and rugs- unique items such as kachinas, basketry, furniture, pictures, note cards, and even some Pre-Columbian artifacts dating back thousands of years. You will find treasures here from pre-historic times through contemporary art. THE GALLERY tries to include only fine examples of pieces made by Matriarchs and Patriarchs of the arts, and by traditional, recognized artists as well as aspiring and established contemporary artists. Some pieces are not signed, but attributed to well-known artists of the past. Other unsigned pieces such as pre-historic pieces and historic art are designated by area and period. IN ADDITION to North American art, Spirit Horse Gallery also carries fine examples of arts from Latin America, South American and Mexico, pre-historic through contemporary. I HOPE you will enjoy your journey through the lovely creations of ancestors of the Americas and, in particular, of the Southwest, and of the later generations of proud and talented families of Pueblo and Mexican artists. AS ALWAYS, if you have any questions, please feel free to e-mail the owner, Carole K. Boyd. You may expect a prompt response! Enjoy your browsing through the centuries of Spirit Horse Gallery art. Payment methods include certified check, bank check, postal money order and personal check (subject to clearance).